The red bars in Figure 1 show that by 2027, the tax cuts lead to an economy that is 1.1 percent larger than under the old tax system. However, an all-out trade war, a worst case scenario where the U.S. is completely closed to trade, would have the opposite effect. 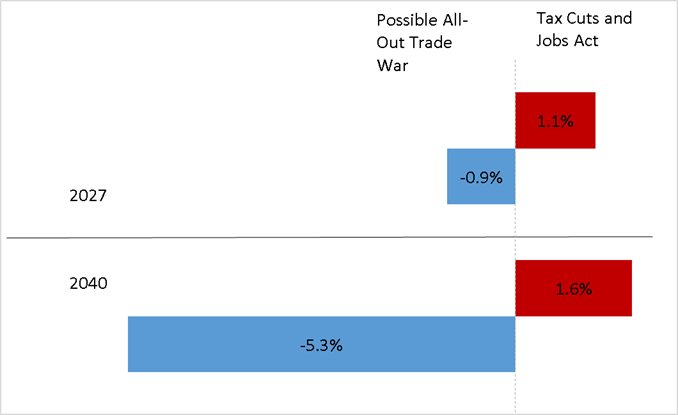 So, in 2027, the combined effect of the tax cuts and an all-out trade war is an economic wash. By 2040, the net effect of the tax cuts and an all-out trade war is an economy that is 3.7 percent smaller than otherwise. Note: Percentage change relative to current policy in 2027 and 2040, respectively. Projections are based on high return to capital. Under the Tax Cuts and Jobs Act the economy is modeled as 40 percent open, consistent with previous evidence. Under the All-Out Trade War the economy is modeled as 0 percent open.